The most prestigious award given by WVCTM is the Distinguished Service Award, presented to the individual who has done exemplary work statewide in mathematics education. The award includes a Captain's Chair with an engraved plaque, hence it is often referred to as "The Chair" Award. The 2015 recipient is Holly Plunkett, currently a mathematics teacher at Tucker County High School. Although Holly's path traversed many states including Delaware, California, and Pennsylvania, she finally arrived in West Virginia and has proven herself not only to be a passionate mathematics teachers, but also a valued member of WVCTM. Holly agreed to assume the position of treasurer of the organization five years ago and readily embraced all that it encompassed. With a wealth of change occurring including a new venue for the annual conference and use of internet registration and payments, Holly rose to the challenge dedicating countless hours to WVCTM. 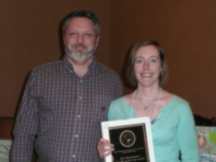 A former State Mathematics Coordinator stated, "Holly Plunkett has been a leader among high school mathematics teachers in West Virginia for the entire eight years I served as mathematics coordinator. She led statewide professional development for hundreds of teachers over a period of five years during our Teacher Leadership Institutes. She presented on formative assessment strategies and content-specific sessions for county level professional development as well. She served on the review team for the Common Core State Standards and created curriculum units for both the 21st century standards and the Next Generation Standards. She served in an advisory capacity for the state math coordinator on a number of related topics including the integration of technology in the math classroom. Her influence and effects on teaching and learning of mathematics in West Virginia are everlasting." Holly has been recognized as a Presidental Awardee for Excellence in Mathematics Teaching, as a WVCTM Secondary Mathematics Teacher of the Year, and as a National Board Certified teacher. Few high school teachers are truly prepared to respond to those fleeting opportunities in a classroom that must be sensed and seized by the teacher. Holly is one of those teachers who can utilize those moments to capture the collective interest of the students and cause them to realize the beauty and power of mathematics. Dr. Johanna Bolyard was recognized as the 2015 College/University Mathematics Teacher of the Year. She is currrently a professor in the College of Education and Human Resources at West Virginia Universty. Recognized by both pre-service teachers and those in the field as a motivating and passionate instructor, she has been integrally involved in the development of the Elementary Math Specialist program at WVU. She not only designed the C&I coursework, but she has also taught a class that is a part of this program every semester since its inception. A colleague writes, "Dr. Boyland is an accomplished teacher, who models her love of mathematics to her students every day. She has a passion for education and a love of mathematics. She has the highest amount of respect from her faculty colleagues at West Virginia University. She is student-centered and is frequently nominated for teaching awards by her students. She also has a national reputation from her teacher educator peers across the country. A review of her curriculum vita shows she is a top scholar and viewed as a national leader in mathematics teacher preparation. Most importantly, the K-12 system in West Virginia benefits tremendously from having Dr. Johnna Boyland prepare the next generation of mathematics teachers." Although most of her teaching assignments are related to elementary education, she has also impacted secondary mathematics education majors as well. One former student and current high school teacher noted, "The way I question students, the way I frame material, and the way I have students solve problems changed from what I had done in the past. I really emphasize thinking about things in a diffferent way and considering different solutions. This is all because of Dr. Bolyard's class. She made me excited about being a math teacher, and I realized the possibilities that exist when teaching. She is an inspiration to me, and I know she is to many other mathematics teachers as well." She is currently coordinating professional development opportunities in mathematics for teachers across Monongalia County, and has provided strategies as these teachers implement the new standards. Stephanie Jones was recognized as the 2015 High School Mathematics Teacher of the Year. Stephanie is currently a mathematics teacher at Fairmont Senior High School. She received her bachelor's degree in mathematics education from Fairmont State University, a master's degree in mathematics from West Virginia University and is currently pursuing a doctorate in Curriculum and Instruction with an emphasis on mathematics. A colleague noted that "Mrs. Jones' instructional responsibilities incorporate a broad range of mathematics and wide spectrum of students. It is obvious to anyone visiting her classroom that her love for and interest in mathematics are integral to her teaching. I recently hear a student say, 'Mrs. Jones is the only one who can teach me math.' Students are not the only ones to 'sing her praises.' Her peers, including myself, often come to her for help with a math problem or to 'borrow' ideas of classroom organization or creative lessons." Stephanie has assumed several leadership positions: Project Assistant for WvEB Mathematics – a project that allows high school students to enroll in college-level mathematics courses, RESA VII Regional Math Field Day High School Level Director, and coach of the non-defeated Fairmont Senior High School Math Field Day team. She also serves on the Fairmont State University Mathematics Advisory Committee, Curriculum Mapping Committee, and the Next Generation Common Core Cadre. As a colleague shared, "Stephanie is an outstanding teacher and caring person whose infectious enthusiasm for learning influence her peers and students in memorable ways." 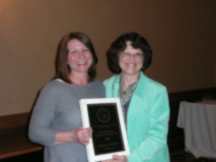 Sandra Humphries was recognized as the 2015 Middle School Mathematics Teacher of the Year. She is currently a mathematics teacher at Mountain View Elementary/Middle School in Monroe County. Her principal writes, "Sandy encompasses a vision for student learning, a model for teacher effectiveness, and a discipline for student achievement. She has provided leadership in application of our school's vision and mission through facilitating collaboration for our School Improvement Plan and providing curriculum guidelines for student learning." A colleague adds, "Sandy is not only a great teacher but is also a great mentor to all she meets. She truly lives our county motto: Lift every child. She can reach the child who struggles with poverty, self-doubt, or learned helplessness with her organization, strategies such as student created/teacher guided resource books, and assignments that integrate vocabulary, visual prompts, and explanations of process and final results." A member of the Project MERIT cadre, a five-year project that impacted middle school mathematics teachers throughout West Virginia, Sandy served as a mentor teacher. She wrote instructional guides for the WVDE following "Understanding by Design" guidelines for performance tasks. She also served on the original Common Core mathematics committee that completed the alignment to the 21st Century Standards. Sandy truly knows what mathematics teaching and learning should look like and is a role model who is always willing to share her expertise with colleagues and novice teachers alike. 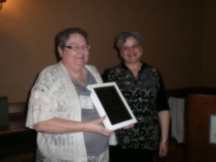 Tami Marks was recognized as the 2015 Elementary School Mathematics Teacher of the Year. A teacher at Mount Nebo Elementary School in Nicholas County, Tami has taught a split grade almost every year of her teaching career. A colleague wrote, "Despite the challenges that teaching a split grade presents, her students show high growth every year. Tami is always seeking new ideas to bring to her students, incorporating lots of technology in her instruction. She has taken on leadership roles at her school and at the county level in mathematics. Tami is currently taking courses toward the Elementary Math Specialist Certification through WVU." Her students added: "She keeps you going and makes sure that you don't give up. She pushes your limits and she rebuilds them much, much higher." "She changed my view of math and life. Her stories from math mistakes to Black Friday are truly inspirational." "She is a great teacher because she makes sure that everyone understands the subject and lesson even if it takes forever." "She is a really good math teacher because she helps us thoroughly understand the hardest problems. She is awesome and she is the formula to amazing." Tami's desire to think deeply about mathematics as she seeks to develop mathematical ideas in her students is truly an asset to her school and will undoubtedly have far-reaching effects as these students progress through mathematics curriculum.